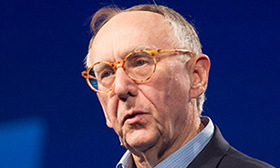 “We are undergoing a massive digital transformation,” said CEO and president of Esri, Jack Dangermond, deliverer of the traditional Monday opening keynote at the plenary session. GIS and mapping provide a fundamental language for understanding our world, while providing context and content about everything. Dangermond states the obvious: our world is increasingly challenging, as natural disasters increase, and climate change demonstrates that our current state is not sustainable. Those who work with GIS data need to be smarter and muscle all the best science, he said, we need to understand, to act together, to turn this around. The newly coined phrase “Smart GIS” is used to describe a framework to process, manage, create and make data understandable. Decisionmakers can plan for the future with the analysis of relationships between phenomena. 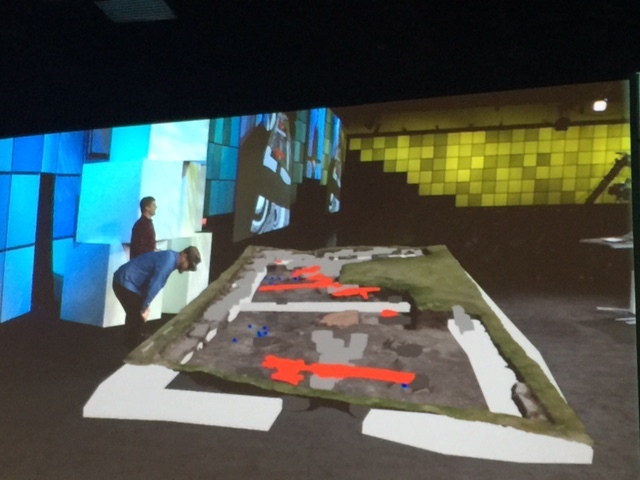 While Esri products and services have been moving toward breaking down barriers for years, the new Smart GIS technologies can offer earthquake alerting in the form of apps, as well as flood analytics and predictions, and many other opportunities to respond quickly and efficiently in terms of emergency response. “Smart GIS is revolutionizing how we plan and design, integrating urban design, business development, and urban planning,” said Dangermond. Community GIS is emerging as a pattern in cities. Data is put into a GIS and is made available through the Web to many people: citizens, NGOs, and civic organizations. An example is GeoHub for the City of Los Angeles, unveiled earlier this year by Mayor Eric Garcetti and Esri President Jack Dangermond. GeoHub is one of the nation’s most complete collections of urban map data. The GeoHub builds on Mayor Garcetti’s third Executive Directive, which created L.A.’s first open data portal. By making more than 500 types of map data available to residents, city workers, and private industry, the GeoHub helps Angelenos better understand their communities, and City departments better coordinate construction, road paving, and public safety efforts. As part of the mayor’s Clean Streets Initiative, they are using Streetwise to pull data into a single map, so that any citizen can see what’s happening on their street, private developers can see where to build and contractors have an idea of how to construct. A new focused initiative within GeoHub is Vision Zero aiming to eliminate deaths and serious injuries on the road. It brings data onto a single page, layers it with KPIs and community data. 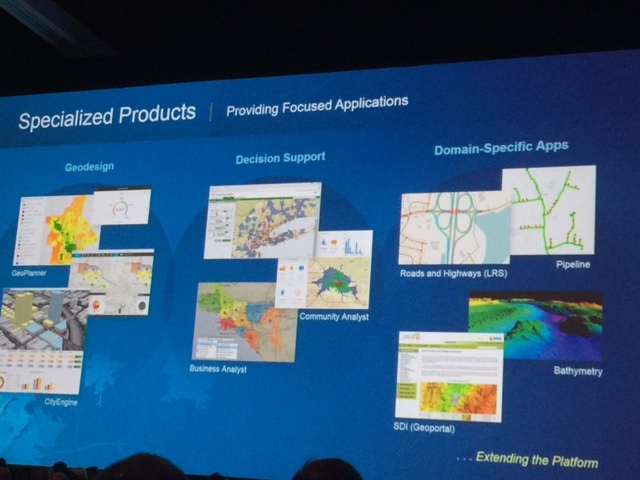 The entire goal of Esri is to create software, services and apps that enable GIS users. ArcGIS is the company’s system for managing and applying geographic information. 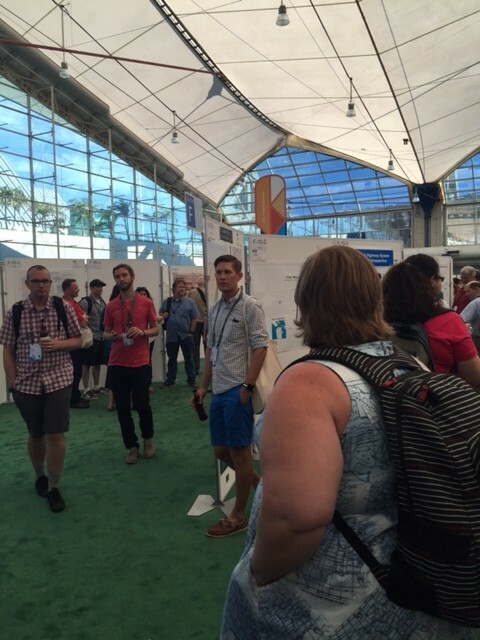 ArcGIS is beginning to move into communities of organizations. It enables multiple types of systems, systems of record, of engagement, and of insight. These all reside in one platform. In terms of integrating the organization, this type of approach requires no interoperability between different types of systems, because they all reside together on the one platform. “We are moving from simply supporting the client server to also supporting web services and apps, so I can access without being an expert,” said Dangermond. Field GIS, introduced by Michael Goodchild, has become invaluable for collecting field data and managing field workers. The Living Atlas is becoming a major tool for users with its ready to use maps and datasets, compiled from basemaps, imagery, demographics, landscape. Esri’s partnership with DigitalGlobe will add their best imagery for the entire planet. It consists of thousands of maps and also contributions from GIS users, with billions of maps used every week. With Mapping & Visualization advanced tools for 2D and 3D, and Spacetime integration, Esri introduced multi-scale symbology. In ArcGIS Pro, you can produce your own vector tiles, and there are thousands of organizations using these as standard for topo, aeronautical, and marine. A new web app available this year is Insights, that allows you to do exploratory spatial analytics with your data, and is intuitively responsive. 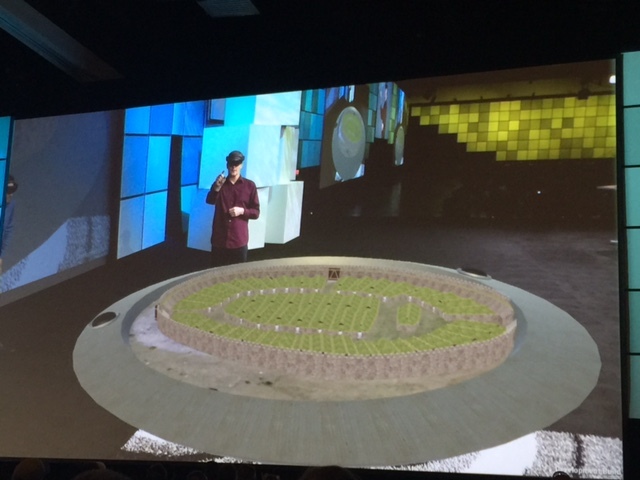 According to Linda Beale of Esri, data is visualized in various ways. All attributes are exposed so you work directly with that data, visualized as maps, charts or tables. All “cards” are linked to everything interactive. The online version of Insights is available for free. It is not just for GIS professionals, but is a geospatial intelligence system designed to analyze a lot of data. Other spatial analysis tools such as Locate Optimum Regions provide data on the best place to locate parks, etc. Landscape Corridor Selection is for tracking wildlife corridors, and improving integration with the Optimum Regions open source package. ArcGIS can use Optimum Regions and users can use the power of geospatial databases. Other spatial analysis tools include geoanalytics and the visualization of massive data, as well as parallelized analytics on raster and vector data. New and improved capabilities across the 3D platform are what we can look forward to in the future. Visualization is now done from a browser coming out of servers. This means open access to 3D in dimensional time to browsers everywhere. 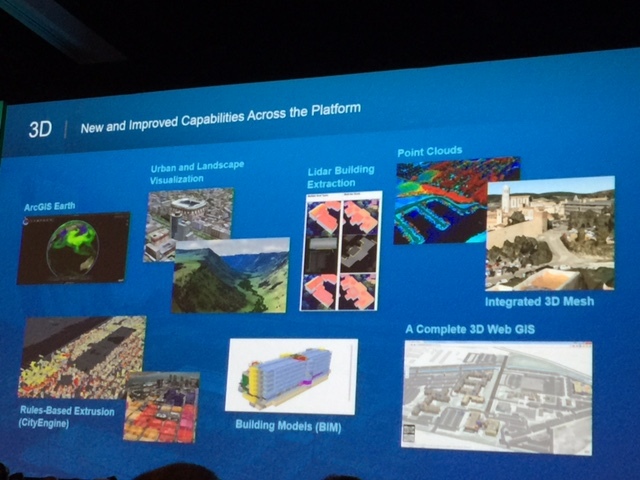 Users can build and manage 3D city models. In a development review in Cambridge, MA, Kindle Square, in the Harvard University urban campus they can integrate with building sensors and monitoring done in a web browser. ArcGIS Pro and CityEngine can share layers. SmartBetterCities’ new release of CloudCities virtual reality tool, can be used can be imported from CityEngine, SketchUp and GoogleEarth. The models are based on OpenStreetMap, lightweight and used mostly by mobile users. In 3D imagery, there are now improved capabilities for ortho mapping, image management and analytics. Drone2Map is Esri’s new software product that requires an ArcGIS Online license, that can be used in a drone to grab imagery and take full motion video. From that, you can get a 3D point cloud and use it directly in your GIS model. New Story Maps are available for crowdsourcing and photosourcing. Web AppBuilder now has a 3D environment, AppStudio – that can be used on your own device to develop an app, and recompile which is not your device. You design once and it can be deployed in other devices. There are also Development and Scripting Tools (for extending, customizing and embedding) available, plus code sharing among users, reminiscent of ArcScripts from the past. Thousands of implementations of ArcGIS are available in different environments. Esri supports multiple formats – open standards and open format, products integration, and open software. ArcGIS Desktop consists of ArcMap and ArcGIS Pro. ArcMap will continue to be supported. ArcGIS Pro will replicate the features of ArcMap implemented in 64-bit architecture, smart mapping, and better editing. What’s coming next year: strong support for big data integration, parcels and utilities, grids and graticules. 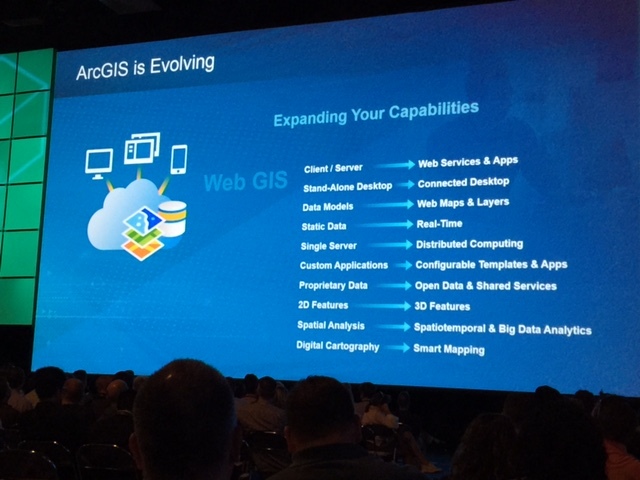 ArcGIS Online is hosted WebGIS, that introduced smart mapping tools, social logins, has over 3 million users, analysis tools, vector tiles, credit allocation, and enhanced OGC support. Coming up: improved search and data management, organization-to-organization collaboration, raster analysis, and more content. 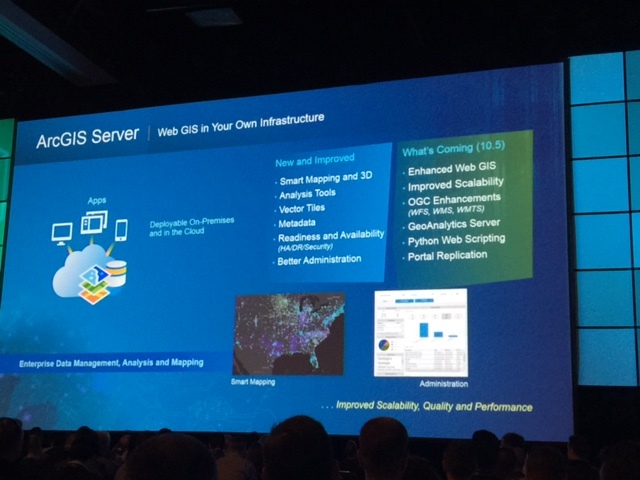 ArcGIS Server is Web GIS in your own infrastructure, and can be deployed in your own cloud, as well as the regular cloud. New next year is the enhanced Web GIS, improved scalability, OGC enhancements, GeoAnalytics Server, Python Web Scripting, and Portal Replication (supports portal to portal across organization). Server based computation is said to be not only possible but inevitable. 5,000 NGOs gain rich ecosystems from users, and an understanding of nature and ways to protect it, by supporting green infrastructure initiatives. 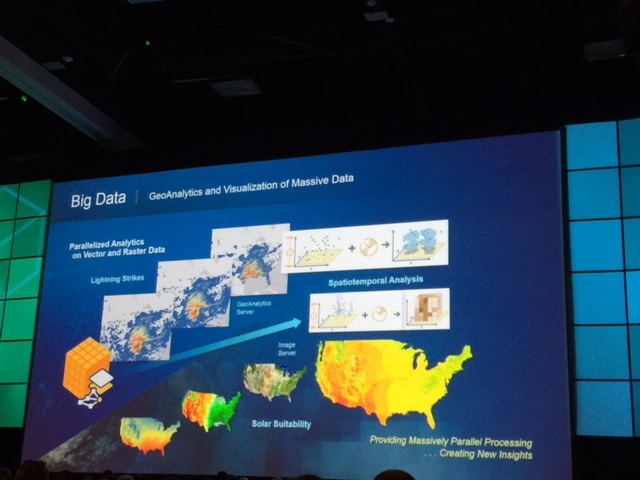 Vector basemaps in the Living Atlas published by NOAA, Esri and partners are generating a lot of excitement, plus the Digital Globe imagery for over 200 sq km worldwide coming soon, according to Lauren Bennett of Esri. Every phone is a sensor continuing to monitor the world. Imager in ArcGIS provides image management and processing tools. There is access available to compute change such as the volume in ice in the Arctic, with over 350 TB imagery stored in the Amazon Cloud, as well as multispectral imagery available on the fly, and the ability to compare it historically. These services and apps are useful for studying the effect of climate change. The City of New Orleans is using Collector for ArcGIS to collect photos with two consumer cameras with built in wide angle lenses and an integrated GPS for location. They matched the photos to the nearest location for scoring. As hurricane season approaches, the city asks people to take photos of their houses. With this tool they have updated land use and permits. They have an application for land use for citizens so they can participate and a crowdsourced story map to show how much water is in catch basins. Kalmar County Museum has used drones to fly over the remains of a ring fort at Sandby borg on Oland island off the Scandinavian coast. Islanders were forced to built ring forts to protect themselves against invasion by the Roman Empire. Since 2011, the Department of Museum Archaeology at Kalmar County Museum has been conducting archaeological excavations in the ring fort. Human remains were found during the very first excavations. Image classification highlights some of the foundations of the ring fort. A dog called Fabel is specially trained to smell human bones. He can tell the difference between animal and human bones. With Collector for ArcGIS and the Leica Zeno 20 for high accuracy field collection strapped on him, the device tracks his search pattern and collects data along the way. While we have likely visited places in the world named after Alexander Von Humboldt, and seen animals and plants named after him, probably the name doesn’t mean a lot to a vast majority of people. Humboldt was a visionary naturalist born in 1769, as the son of a wealthy aristocratic Prussian family. He spent his entire fortune on a five-year expedition to Africa, which shaped his thinking. In his time, he was the most famous man after Napoleon, a “Shakespeare of the sciences.” He influenced some of the most important thinkers of the time – Charles Darwin, who said he wouldn’t haven’t written The Origin of Species if not for him. John Muir’s writings, Thoreau and Emerson were also influenced by him and Thomas Jefferson consulted with him about the Louisiana Purchase. Statesman Simon Bolivar said his life was invigorated by Humboldt. A plant distribution map created by Humboldt displayed different vegetation zones across the globe. “He was the forgotten father of environmentalism,” said Wulf. For Wulf, writing the book was a journey through letters and landscapes, as she traveled to many of the places that Humboldt traveled to and researched. Charles Darwin took Humboldt’s books on the Beagle with him around the world. No one had ever presented scientific data so visually before, and Wulf suggested that what Humboldt was doing was “early GIS,” making relationships between things. His vision of nature clarified, and was like a botanical journey, viewing how vegetation had changed from the tropics to the higher elevations, with vegetation levels stacked on each other. Struck by this resemblance to other places in the world, he saw the vegetation as a global force. His brother, Wilhelm, said he thought his brother’s mind was designed to connect chains of things. 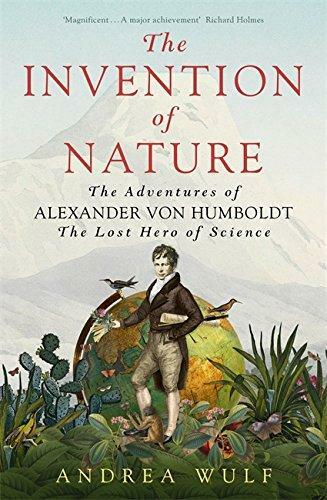 Humboldt’s contention that nature must be experienced through feeling and imagination drove him to various corners of the earth to make discoveries, map the regions and experience waters, plants, people and animals. He believed the native indigenous people were “the best geographers and observers of nature.” Even in those times, forests were being felled to make way for cash crops and the water levels of Lake Valencia, for example, were lowering because farmers were diverting water for crops. His maps included economic data, transportation of precious metals across the world, distribution of human races across globe, geomagnetism, volcanoes, earthquakes and tsunamis. Charles Perry, PHD and Christopher Oswalt PHD of the USDA Forest Service Forest Inventory and Analysis are collecting authoritative data and sharing it with the public. They collect and assess census, survey and national sampling design data for over 50,000 plots, resulting in a database with more than 19 million trees, that all begin with a sample. They are measured by crews who have made a career out of collection. Conservation of endangered species and native pests and exotic pests are increasingly common in eastern forests. National scale data and analysis, are necessary for the program to remain relevant into the future, and they are educating public so they can participate. The new technologies of today are taking the principles that people like Alexander Von Humboldt lived by and applying them to the challenging problems of today’s world. What leaps predictive analysis, mapping and visualization have taken since the 19th century! What took years to accomplish in those times can now take hours. And today, with so many ways to gather data and to mine it, we still ask the question, “what do we do with all this data?” and spend the majority of time figuring out how to make the wealth we have gathered actionable. The evening’s Map Gallery presentations, always a treat, showcased the maps and research that has been done over the past year by different agencies, universities and individuals, with topics ranging from climate change, environmental issues to precision farming, natural disasters, emergency response and defense – and everything in between. This entry was posted on Saturday, July 2nd, 2016 at 12:42 pm. You can follow any responses to this entry through the RSS 2.0 feed. You can leave a response, or trackback from your own site.